When g‘(x) = f(x), you can use the substitution u = g(x) to integrate expressions of the form f(x) multiplied by h(g(x)), provided that h is a function that you already know how to integrate. 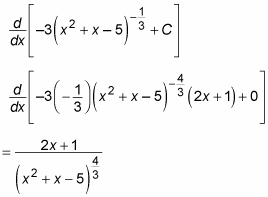 Variable substitution helps to fill the gaps left by the absence of a Product Rule and a Chain Rule for integration. At this point, you can solve the integral simply. Again, this is another integral that you can solve.